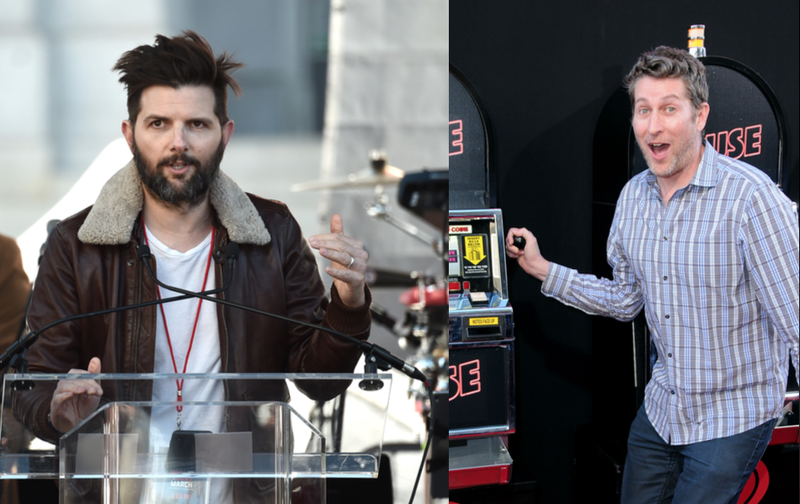 Adam Scott and Scott Aukerman have a new band-based podcast, R U Talkin' R.E.M. Re: Me? Filed to: R U Talkin' R.E.M. Re: Me?Filed to: R U Talkin' R.E.M. Re: Me? U Talkin' U2 2 Me? And dos, tres, catorce: Adam Scott and Scott Aukerman are back with a new podcast. In the spiritual tradition of their previous, centuries-old podcast, U Talkin’ U2 2 Me?, the pair have found a new muse: Adam Scott’s favorite band of all time, R.E.M. It is a foregone conclusion that we will not listen to this band. Actually, it’s a foregone conclusion that we will be listening to this new Earwolf podcast, given the 24 episodes of the duo’s U2-centric series was some of the more entertaining listening of those respective calendar years. Starting with R.E.M.’s first single “Radio Free Europe” and first EP (Chronic Town), the podcast promises to delve into all the dark corners of the band’s history and discography (the “American U2,” as the group is referred to, by Scott anyway) for however many episodes it takes them to work their way through it all. As you listen to the first episode directly above, you can also head over to Stereogum, which has an interview with Aukerman about the new show—right below an exhaustively detailed account of just what happens on these podcasts and why it can be so daunting for new listeners. (Short answer: In-jokes. Lots and lots of in-jokes.) But if you’re giving it a shot for the first time, it sounds like there has been at least nominal effort made to make this new podcast an accessible jumping-off point for people curious to take a listen. Whether you love or hate R.E.M. is largely incidental, too, because if it’s anything like U Talkin’ U2 2 Me?, there will be as much time spent on literally any other topic under the sun as there will be on the band and its music. Enjoy the next two hours and 11 seconds of hot R.E.M. talk. Scott Aukerman picks his 5 favorite episodes of Comedy Bang! Bang!